Written by: Other Writer on January 29, 2019.
International law devotes a great deal of attention to its sources. Scholars have produced a large body of work about both the conditions under which treaties, customs, or general principles of law bind actors and the hierarchy among the various doctrinal forms which might apply in a given instance. International law is made largely on a decentralized basis by the actions of the 193 States which make up the international community. 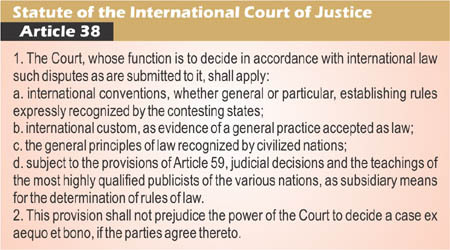 Article 38 of the Statute of the International Court of Justice lists sources of international law on which the court may rely in its decisions. They are: treaties, customary international law, general principles of law that exist in most domestic legal systems and, as a subsidiary means, also judicial decisions and scholarly writings. Customary law is both the oldest source and the one which generates rules binding on all states. Customary law refers to the established practices of states that are supported by a subjective belief to be required by law. If a customary rule exists, it is binding on all states except where a state has persistently objected to this rule. Customary law is not a written source. A rule of customary law, e.g. requiring states to grant immunity to a visiting Head of State, is said to have two elements. First, there must be widespread and consistent state practice, i.e. States must, in general, have a practice of according immunity to a visiting Head of State. Secondly, there has to be what is called “opinio juris,” usually translated as “a belief in legal obligation, i.e. States must accord immunity because they believe they have a legal duty to do so. 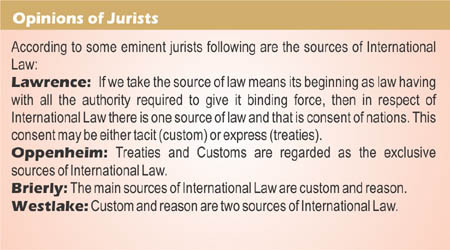 A new rule of customary international law cannot be created unless both of these elements are present. Practice alone is not enough nor can a rule be created by opinio juris without actual practice. Treaties (sometimes called agreements, conventions, exchanges of notes or protocols) between states – or sometimes between states and international organizations – are the other main source of international law. Hence, the most important and most concrete sources of international law are bilateral and multilateral treaties. Multilateral treaties are usually prepared during long negotiations at diplomatic state conferences where a final treaty text is adopted and then opened for signature and ratification by states. When an agreed number of states have ratified the treaty, it enters into force and becomes binding on the member states. However, a treaty is not a source of law so much as a source of obligation under law. Treaties are binding only on states which become parties to them and the choice of whether or not to become party to a treaty is entirely one for the state – there is no requirement to sign up to a treaty. A treaty which is freely negotiated between a large number of states is often regarded as writing down what were previously unwritten rules of customary law. A good example is the Vienna Convention on the Law of Treaties, 1969. Less than half the states in the world are parties to it but every court, which has considered the matter, has treated its main provisions as codifying customary law and has, therefore, treated them as applying to all states whether they are parties to the Convention or not. General principles of law recognized by civilized nations – the third source – are seldom mentioned in judgements. They are most often employed where the ICJ or another international tribunal wants to adopt a concept such as the legal personality of corporations which is widely accepted in national legal systems. But, international law seldom adopts in its entirety a legal concept from a particular national legal system; instead the search is for a principle which in one form or another is recognized in a wide range of national legal systems. Article 38(1)(d) refers to judicial decisions as a subsidiary means for the determination of rules of law. In contrast to the position in common law countries, there is no doctrine of binding precedent in international law. Indeed, the Statute of the ICJ expressly provides that a decision of the Court is not binding on anyone except the partiers to the case in which that decision is given and even then only in respect of that particular case (Article 59). Nevertheless, the ICJ refers frequently to its own past decisions and most international tribunals make use of past cases as a guide to the content of international law, so it would be wrong to assume that “subsidiary” indicated a lack of importance. Article 38(1)(d) does not distinguish between decisions of international and national courts. 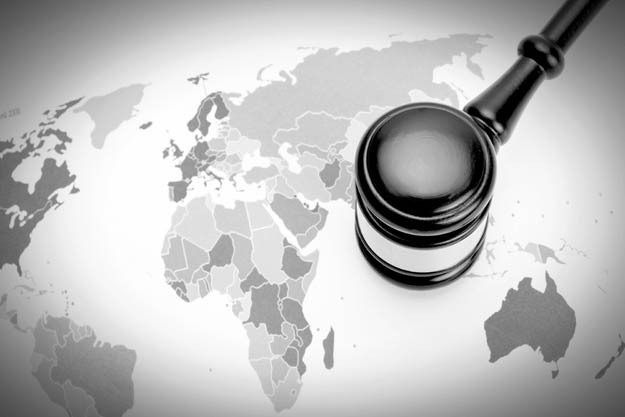 The former are generally considered the more authoritative evidence of international law on most topics (though not those which are more commonly handled by national courts, such as the law on sovereign immunity). But, decisions of a state’s courts are a part of the practice of that state and can, therefore, contribute directly to the formation of customary international law. The writings of international lawyers may also be a persuasive guide to the content of international law but they are not themselves creative of law and there is a danger in taking an isolated passage from a book or article and assuming without more that it accurately reflects the content of international law. According to Article 38 of the Statute of the ICJ, “the teachings of the most highly qualified publicists of the various nations” do constitute a “subsidiary means for the determination of the rules of law”. The list of sources in Article 38 of the Statute is frequently criticised for being incomplete. In particular, it makes no mention of the acts of the different organs of the United Nations. Today, there can be no doubting the importance of those acts in shaping international law, although they perhaps fit within the system of Article 38 better than is sometimes imagined. The United Nations General Assembly has no power to legislate for the international community; its resolutions are not legally binding. However, many of those resolutions have an important effect on the law-making process. Some resolutions are part of the treaty-making process, attaching a treaty text negotiated in the framework of the United Nations and recommended to the Member States by the Assembly. In addition, the positions which states take in the United Nations is part of their practice and a resolution (or sequence of resolutions) which commands a sufficiently widespread acceptance and which is regarded by the states as embodying a rule of international law can have an important effect on the development of customary international law, so long as it is not contradicted by what states actually do elsewhere. Unlike sources of law in the municipal or domestic legal systems, sources of international law cannot be ascertained with the same degree of specificity, clarity and precision. This is attributable to a major deficiency in the international legal system – namely the lack of a centralized legislative authority as exists in municipal law systems. Nonetheless, it is important to note that accessibility to, and systematization of, international law sources have been greatly enhanced by technological advancement and sophistication. This post has been seen 73489 times.